Carol and were really excited to have purchased Donatelli. With the advent of Register A, I was closely watching the successes and failures of certain German pedigrees on the Dutch mare base. Without a doubt, the Donnerhall x Pik Bube cross stallions improve conformation and rideability. Don Primaire leads the entire Dutch stallion population on the conformation index. Donnerhall ranks higher than the vast majority of Dutch stallions on the Dutch dressage index. With the successes Donatelli has seen both in sport and in the breeding shed, I believe completely that he will be an extraordinary influence on the dressage breeding population of North America. Donatelli is by the excellent breeding stallion Donnerhall, who combined a sports career at Grand Prix level ridden by Karin Rehbein with a remarkable breeding performance, including more than 40 approved sons. Donatelli’s damsire is the stallion Pik Bube I, also known as a stallion producing dressage horses. In the third and fourth generation we find the valuable bloodlines of Graphit and Daimyo. The success formula of Donnerhall and Pik Bube I we also see in the pedigrees of Davingon, Don Primero, Duntroon, Da Vinci, Dream of Glory, Domburg, Donnerbube and Don Pikado. Dam Granny’s Girl is a full sister to the Oldenburg approved stallion Placido. Donatelli’s motherline starts with the mare Fusion (v. Frustra II). This line produced also the approved stallions Picard, Dobrock (both at Celle), Daimler, Picadilly (both at Hannover), Grandus (at Zweibrücken) and Lanthanid (in Denmark), as well as the Olympic horse Prestige with Franke Sloothaak. Donatelli had an outstanding 100 day Performance Test at Neustadt-Dosse in 1997. He was “Leistungsklasse I” with a total-score of 121,26 points. For the dressage elements he obtained high marks for walk: 9, trot: 9, canter: 9 and for his character he got a 10! Although Donatelli has a pedigree for dressage, he also showed jumping talent with scores of 7 and 8 for these elements. Donatelli had an extremely good sire’s debut, due to his oldest offspring. His son Dynamico became premium stallion at the Oldenburg stallionshow, his daughter Djerba was sold very expensively in the Oldenburg Auction and Donatorio won the “Materialprufung”. In 2001 his very beautiful son Divertimento was approved. Donatelli himself won 5 times in the S-class in Germany and was fifth in his first Prix St.Georges competition. Donatelli is approved for Oldenburg, Hannover, Westfalia and Rheinland. We stood Iroko for three years for DBNA. Over the course of those three years, I saw many of his offspring in Holland and I handled Iroko himself daily. He is an exceptional individual and an exceptional sire. Iroko offspring unilaterally have good conformation and athleticism. He has been ranked at the very top of the Dutch jumping indices for four years. On top of this, some of the most exciting young dressage horses in the PAVO cup have been Iroko offspring. I believed in this stallion, and I am personally really excited that we had the opportunity to stand at Shooting Star Farm. Iroko is a KEUR stallion with the KWPN. He is also the sire of approved keur stallion Undercover (out of Libero H). He continues to be the highest KWPN ranked sire of jumpers standing in North America. He joins the ranks of Roemer, Zeoliet and Contango as being one of the four keur stallions ever imported to the USA. Zeoliet was by the very modern breeding stallion Ramiro, who has earned the tag Euro-stallion. Ramiro is the sire of several approved stallions in Belgium, Germany and the Netherlands, as well as the sire of internationally known horses such as Donau, Ramzes, Almox Roselia, Rinnelou Z, Rolex, Zamira and Ratina Z.
Zoeliet’s dam, Sargab, has been declaired “prestatie” at the age of 10, which made her the youngest “prestatie” mare in the Netherlands. Sargab has also produced the Z-level dressage horses Wirbeleau and Bauxiet. The dam’s sire is the Thoroughbred Abgar, one of the most influential Dutch sporthorse sires. Zeoliet was a great success at the performance test at Ermelo with 9.2 for dressage, 9 for jumping under saddle and 9.5 for free jumping. Zeoliet was successful in the National Stallion Competition and he went extraordinarily well in ZZ dressage with Roger Schulkens. He is high on the dressage index, but also on the jumping index. In 1995, Zeoliet was 12th place at the World Breeding Ranking for Show Jumping sires. We imported La Vita as a coming two year old. La Vita‘s breeder also bred the KWPN approved stallion Jeraldo. Her 3/4 sister earned a spot as a finalist in the PAVO Cup. In 1996, La Vita was the #1 star mare in the USA and Canada. In 2000, La Vita fulfilled her last requirement for the keur status by successfully completing her IBOP and ranking third in North America for all IBOPs. She had a colt, Pejuta, by Ichnaz that was sold before he was born. Her second colt by Idocus, Rocco SSF, sold at 7 days old and placed in the top five foals of 1998 in the NA/WPN keurings. Gert van der Veen described him as “a perfect foal.” Rocco went on to again place in the top ten as a two year old, and, as a four year old, he became the #1 gelding in North America for jumping and the #3 gelding for conformation. Rocco has gone on to win high point repeatedly at both Training and First Level, as well as placing well in the young jumper divisions. He’s now schooling 4th level with Babs Putnam. La Vita‘s 2000 foal, her first filly, Thea Vita SSF, by Olympic Vincent, was one of three first premium foals at the New England keuring in 2000 and the first foal we kept for our breeding program. Thea has gone on to her ster status, ranking among the top five for movement in North America. Thea is now the much beloved riding mare of Stephanie Sitzberger. 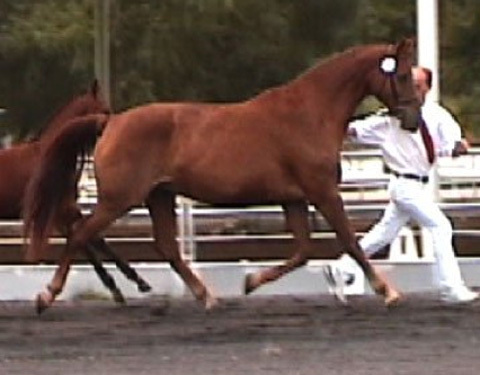 La Vita‘s fourth foal, Udo SSF, by Contango, was sold before he was born to Grand Prix Dressage rider, Melinda Johnson. Our fifth La Vita foal, Viva Vita SSF, by Hierarch is a filly that we intended to keep for our breeding program, but, ironically, we were persuaded to send her to a friend, Anna van Sergae, in California. Anna loved this filly and called me nearly daily to tell me what joy she brought to her. Anna died unexpectedly a short time after Viva arrived. I can only be thankful that one of our horses brought such happiness to her, even if it were for such a short time. Viva is now in dressage training in California. In 2003, for Father’s Day, Carol bought me a breeding to my favorite dressage stallion in the world, Contango! The resulting filly, ZaVita SSF, was first premium and top foal in New England. In 2007, she went on to be the high scoring star mare in New England. We’ve retained this mare for our breeding program and as my riding horse. La Vita‘s 2007 filly was by Freestyle. Cara Vita SSF is a dark, modern, lovely filly who has become part of devoted equine enthusiast, Brook Adam’s, collection of SSF horses. Breeding plans did not work out so well with Ms. La Vita for a couple of years. In 2007, she lost both a Jazz and a Donatelli pregnancy. In 2008, we were fortunate to get her pregnant to Farrington, but she foaled while we were on vacation, only to deliver a stillborn filly. La Vita rewarded us the following year with one of her best foals, a super fancy UB-40 colt, Fantastico SSF, who also stole Brook Adam’s heart. Fantastico has gone on to compete super successfully in the training level division at New England shows with Cindi Rose Wylie. With my cancer diagnosis, 2010 and 2011 were difficult years for us, and we were forced into making some really difficult decisions about selling some horses to downsize while I was sick. Our good friends, Sean and Melissa Hardy, offered to buy La Vita to start their own Dutch breeding program. So, already pregnant for another UB-40 foal, La Vita moved to Vernon, VT, with Sean and Melissa. She went on to produce a super filly, Giada, who became a new ster mare this year and passed her IBOP with one of the highest scores in North America. Sean and Melissa also produced La Vita’s third Contango foal, Isabella. She was just the top yearling filly in North America this year, further cementing La Vita’s ability to produce top offspring over nearly two decades of breeding. And, with more joy than I can express, I was thrilled that La Vita returned to Shooting Star Farm in 2015. We love this mare and missed her. Hopefully, she has one more filly to contribute to our program. La Vita produced one more foal for us, a super colt named Last Child. Unfortunately, both La Vita and Last Child were struck by lightening and killed in June of 2016. Felicites, aka, Ms. P, for “Miss Perfect”, was, indeed, one of our prettiest and most perfect foals. From the beginning her gaits have been outrageous and her sense of balance and the power and quickness in her hind leg demonstrate exactly the kind of mechanics we want to see in a potential upper level horse. Ms. P has now joined KC Dunn’s breeding program at Timbach Farm. In case you haven’t been counting, Nora is our fifth Orchis daughter. We are, indeed, blessed. As much as our first Totilas filly is my “heart horse”, this one is Carol’s. She looks very much like her big sister, but “big” is the operative word! Mazey is a solid 17 hand mare; Nora is going to be more like her sister D’Orites and her mom–she will probably top out at 16 or 16.1. That being said, she is an even better mover than her older sister. Nora absolutely fires from behind and lifts into the air. She was first premium and top foal in New England in 2012. Sadly, Nora suffered a fatal injury and is no longer with us. LaLiscia is on loan to SSF from former DBNA member, Trish Smith. I have always believed that, in the Dutch population, there are certain desirable traits found only in the Thoroughbred. 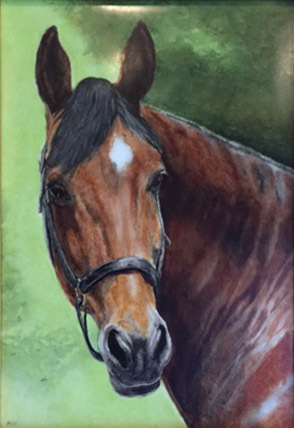 We started our program with a lovely, old Thoroughbred mare in the late 1980’s. At the time, I didn’t know how to use this gene pool effectively. A decade and a half later, I had begun looking for the right Thoroughbred genetics to bring back into our program. Viola! Along comes LaLiscia. Now, I don’t pretend to be a Thoroughbred pedigree expert, but I do know what I want from the gene pool: length of skeletal structure, phenomenal shoulder and saddle position, great canter, legginess, and heart. Well, LaLiscia has all this. Plus, she competed successfully as a jumper, and then went on to a career at lower level dressage. She has produced four super foals. And, according to my favorite Thoroughbred pedigree devotee, Mrs. Susan Duncan, “This mare is a once in a lifetime opportunity. She has a better pedigree for producing sport horses than any Thorougbred stallion standing anywhere. You’ll never find another one like her.” Well, if I needed any more convincing than that, LaLiscia has produced one of the very best foals we’ve ever bred, an incredible Iroko filly, Aerosmith SSF. Last year, “Stevie” went on to not only achieve her ster and keur eligible statuses, she became the Champion KWPN-NA Jumper Mare of North America! Liscia produced two super mares for us: Carpe Diem SSF by Farrington and Eliscia SSF by UB-40. Her granddaughter LeLiscia SSF by Governor out of Eliscia SSF won top dressage foal in North America in 2016. Liscia enjoyed her retirement days at SSF and has since passed away peacefully. We owe a huge thank you to Bart Henstra and his family for allowing us to lease Anerina. 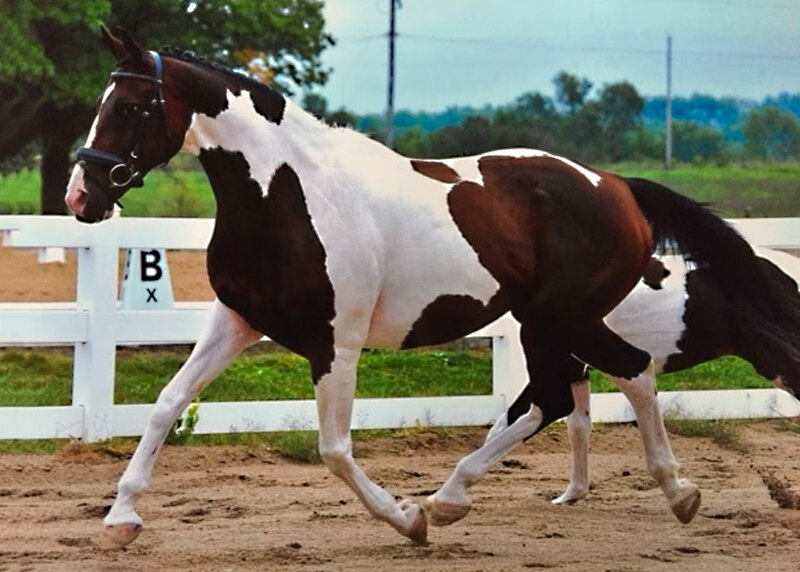 This mareline has produced countless top sport horses. Again, the Dutch pedigree enthusiast in me nearly salivates at the combination of Lyjanero on Indoctro on Purioso on Nimmerdor on Marco Polo. The few times that I have actually seen this filly in the flesh, I’ve been super pleased by her balance and her movement. She’s bred to be a jumper, but, as a younger horse, she had a lot of movement. We went on to sell this mare. Her new owners fulfilled the requirements for her Register A status, and Hanerina became a ster mare. New England keuring in 2003. Now, we don’t actually own this mare, but I have made arrangements to buy her 2005 foal. Our good friend, Alicia Winter, of Winter Warmbloods in Kent, Ct., imported this mare on a buying trip with me four years ago. T.Lente has gone on to be a top ten ster mare, top ten keur mare, and an exceptional beauty. In my ever elusive search of adding Cabochon blood to our program, I couldn’t help myself. So, filly or colt, this Freestyle x Cabochon will be one of the most anticipated SSF 2005 arrival. I’d also like to say that I’m really proud of Alicia. She has presented only four horses at NA/WPN keurings, but two of them have gone top ten. Excellent work! Do you believe in fate? I’m beginning to! Since I have had the mixed blessing of dealing with colon cancer over the past year and had to stop teaching for much of the late winter and early spring, I did what any reasonable, always-striving-to-learn-more breeder would do: Went on an extended horse vacation. I almost always go to the KWPN Stallion Show, so when Judy Yancey invited me to continue on from there for eight days in Germany, what could I say? Yes!! Well, on this trip, I fell in love with a jumper stallion. All good sense and every other form of rational thinking told me, “Forget him. You don’t breed jumpers. Jumpers foals don’t sell in the USA. You’ve even stopped looking at jumpers and jumper pedigrees since the KWPN breeding directions split. Don’t be stupid.” My course of action? When I came back to Holland, I went to Bart Henstra and said, “I need to lease a jumper mare.” Bart and I originally agreed on an Indoctro x Burggraaf mare Stal Henstra had for sale. Well, she sold that week. I’m not sure whether Bart took pity on me because he realized how delusional I was/am, or what, but he offered me another mare to replace her: Anerina. If you follow jumper breeding at all, you’ll recognize that this is a top jumper mareline and the foundation of the Stal Henstra jumper breeding progam. And, to make things even sweeter, Ms. Anerina conceived on the first try. So, here we go! We got a lovely Lyjanero x Indoctro x Purioso filly in late February of 2012, Hanerina SSF.